It was the day after, or was it two days after? Never mind, but soon after the Zimmerman verdict, I watched and posted some videos of protestors in San Francisco and made the point they were primarily white. They looked to me like the same cast of characters from Occupy Oakland, just over the bridge from San Fran. It looked not at all like a riot based on racial anger. I grew up in Miami and no what riots look like. I also recall what Occupy looked like. Enough said. "In 1847 the London Communist League (Karl Marx and Frederick Engels) used Hegel's theory of the dialectic to back up their economic theory of communism. Now, in the 21st century, Hegelian-Marxist thinking affects our entire social and political structure. The Hegelian dialectic is the framework for guiding our thoughts and actions into conflicts that lead us to a predetermined solution. If we do not understand how the Hegelian dialectic shapes our perceptions of the world, then we do not know how we are helping to implement the vision. When we remain locked into dialectical thinking, we cannot see out of the box. Absolutely predictable. 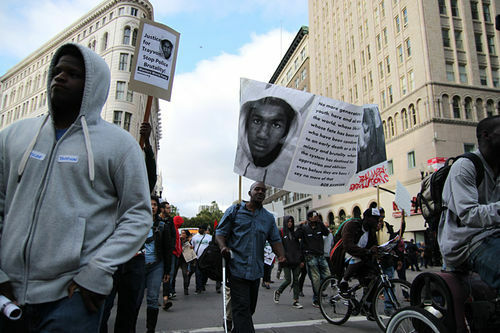 It turns out that communists are stirring racial tensions and are directly involved and behind the Trayvon Martin protests in numerous cities including Oakland, San Francisco, Los Angeles, Chicago and New York. All Progressive strongholds. Meet Bob Avakian of the Revolutionary Communist Party. At 70, he’s still getting his kicks with fomenting mob violence, race baiting and cop hatred.